Consistency is not a word to be used too freely in relation to Gus Van Sant. Like Steven Soderbergh he has oscillated between arthouse and mainstream, so one never quite knows what’s coming next. For every bleak, existential drama such as Last Days (2005), there’s a heart-warmer like Good Will Hunting (1997). One of Van Sant’s more unclassifiable projects was a frame-by-frame remake of Hitchcock’s Psycho (1998). This willingness to experiment may be an improvement on the ‘consistent’ diet of schlock served up by many Hollywood directors, but it must create a sense of trepidation at the box office. 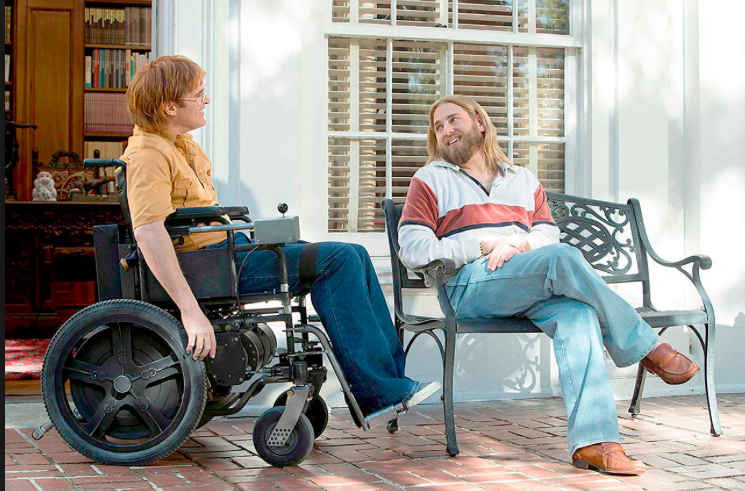 In theory, Don’t Worry, He Won’t Get Far on Foot, doesn’t sound like one of Van Sant’s more populist features. It’s the story of John Callahan, an alcoholic layabout in Portland Oregon, who becomes a quadriplegic in a car crash at the age of 21, only to begin a surprising new life as a creator of non-PC cartoons. The obvious irony is that Callahan’s disability leads to a more fulfilling existence than the one he led before the accident. Much of the film is spent in protracted flashbacks detailing Callahan’s life both before and after he became wheelchair-bound. It feels like a long delaying action, holding back the uplifting moral-of-the-story. On the way to this inevitable terminus, Van Sant shows us a full catalogue of appalling behaviour. Before the accident Callahan is a hopeless drunk who lives from one drink to the next. Afterwards, he still struggles with his addiction while hooning around in his wheelchair like a race-car driver. To make matters worse he is almost permanently steeped in self-pity because his mother rejected him shortly after he was born. The unloving mother is a constant, spectral presence in this story, occasionally appearing to Callahan in his drunken reveries. It’s Joaquin Phonenix’s duty to inject a little sympathy into this catastrophe of a personality. The part of Callahan makes quite a contrast with Phoenix’s other role de jour, in Lynne Ramsay’s You Were never Really Here, as a tender-hearted serial killer. The difference in appearances is startling enough. Gone is the bushy beard and traumatised stare, to be replaced by a ginger mop in a Beatle cut, a pair of thin-rimmed glasses, and a wardrobe that does several variations on the Hawaiian shirt. One of pleasures of Don’t Worry’ is the way every actor looks so different from how we know them. If a shaggy, red-haired Phoenix wasn’t sufficient, we also have Rooney Mara as Annu, a blonde-haired Swede; and Jonah Hill as Donnie, in a long, yellow wig and beard, looking like he just stepped off the set of Jesus Christ Superstar. Annu and Donnie play vital roles in Callahan’s recovery, giving him the confidence to cope with his disability and shake off his alcoholism. He meets Annu when she is working as a carer in the hospital where he is strapped into a device that looks like a sophisticated torture rack. She tells him how good-looking he is, which is a spur to a needy ego. When the two meet again, Annu is working for a Scandinavian airline. This allows Callahan to become one of a very small minority of quadriplegics that have affairs with Swedish air hostesses. Donnie is a wealthy, gay boy who has dealt with his own dipsomania, and now acts as guru to a group of misfits from Alcoholics Anonymous. In this group, Callahan is just one freak among others, quickly learning that his self-pity and ‘poor, little orphan’ routine count for nothing. Part of Donnie’s recommended cure is for Callahan to systematically forgive everyone who has hurt him. On the list is Dexter (Jack Black), the deranged party boy who was driving the car the night Callahan was smashed up. ‘Driving’ is not exactly the right word, because both men were so drunk they were comatose. Dexter, however, escaped wthout losing so much as a hair from his monstrous side-burns. Yet the real engine for Callahan’s resurrection is a passion for drawing ignited and channelled by his disability. The title of the movie comes from the caption of a cartoon in which a posse of cowboys look at a capsized wheelchair. It’s one of his more tasteful efforts. Callahan’s physical state, and his life history, embolden him to take on any topic, no matter how taboo. Blacks, jews, gays, midgets, cripples – any minority is fair game for his scathing sense of humour. Having died in 2010 at the age of 59, Callahan was spared the worst of America’s PC mania, but still managed to offend a broad cross-section of the general public. Today they’d be burning him at the stake. Was Callahan somehow licensed to draw those things that other cartoonists dare not touch? Robert Crumb never held back, but he’s resided in France since 1991. One subtext of Van Sant’s movie is a call for Americans to embrace tolerance and common sense in an age of pathological victimhood. A more banal interpretation is that we should take heart from the fact ‘there’s always someone worse off than yourself’, stop complaining and start living. With such a story the slide into banality is hard to forestall but it’s impossible to argue with Van Sant’s conclusions.